Lion tamarins have a mane derived from long hairs on the top of the head, cheeks and throat. The golden-headed lion tamarin is predominantly black with golden to reddish-orange color on the front of the mane, the lower half of the front paws and part of the tail. It weighs about 0.6 kg (1.3 lb) and its head and body length is about 26 cm (10"). The golden-headed lion tamarin is found in primary lowland tropical forests, such as tall, humid evergreen coastal forests and inland semi-deciduous forests, from sea level to 110 m (370'). Fruit, gums, nectar, and animal prey, including large insects, comprise the diet of the golden-headed lion tamarin. Lion tamarins are diurnal and predominantly arboreal. The golden-headed lion tamarin forages for insects in the middle levels of the forest (12 - 20 m (40 - 66')). This tamarin lives in groups consisting of 2 - 8 individuals. There can be more than 1 adult male and female in each group, but only 1 female breeds. At night the group sleeps in a tree hole. *** Thanks to a massive conservation education campaign, the golden lion tamarin has become a source of pride to Brazilians and a national symbol of conservation. (Cohn 1991; AZA 1998c) . *** In 1995, an evaluation of a community education program which focused on the golden-headed lion tamarin in Bahia, Brazil showed that, although 75% of the people in the community recognized the tamarin from pictures, only 1/3 were aware of its endangered status, and only 19% of farmers in the area knew that the tamarin was seriously endangered (Anon. 1995l) . *** There is now a major conservation program for the golden-headed lion tamarin that includes management of a significant captive population, an active conservation education program in Bahia, a landowner's environmental education program, and a field study of ecology and behavior (Kleiman & Mallinson 1998) . 2004: Occurs in Brazil (IUCN 2004). In the past, the golden-headed lion tamarin and the golden-rumped lion tamarin (Leontopithecus chrysopygus) were both considered subspecies of the golden lion tamarin (Leontopithecus rosalia). 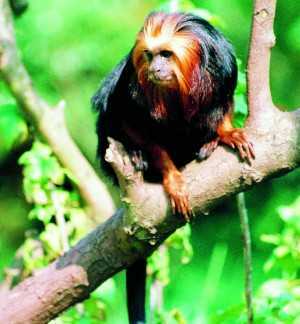 The golden-headed lion tamarin has only been known from the southern portion of the coastal state of Bahia, Brazil. It was originally found between the south bank of the Rio das Contas and the north bank of the Rio Belmonte along the Atlantic Coast. Currently, the population of golden-headed lion tamarins is located in and around the Una Biological Reserve in the state of Bahia (Macdonald 2001). More than 90% of the original Atlantic coastal forest, which contains the golden-headed lion tamarin's habitat, has been lost or fragmented to obtain lumber and charcoal and to clear out areas for plantations, cattle pasture, and industry. The forests where they live are rapidly disappearing. In addition, capture for use in zoos, laboratories and the pet trade has contributed to its decline. International trade in live tamarins has been reduced, although internal trade still occurs (Seal et al. 1990, Macdonald 2001 ). Two golden-headed lion tamarins bred at the age of 12.5 months, producing one young when they were barely 16.5 months old (captivity) (Tamarin Tales 2001) . A male sired his last offspring at 18 years and two months (captivity) (Tamarin Tales 2001) . A male died at the age of 18 years and seven months (captivity) (Tamarin Tales 2001) . Lion tamarins are diurnal and predominantly arboreal. 0.9 - 3.0 groups/sq km (2.3 - 7.8 groups/sq mi). 4.6 - 16.7 individuals/sq km (12 - 43.4 individuals/sq mi).